Scale Designs for different applications. 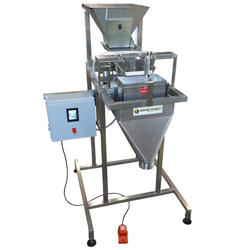 The PMB net weighers are vibratory scales that are versatile for almost any application within a package weight of 2 grams to 50 lbs. and for thousands of food and non-food products. 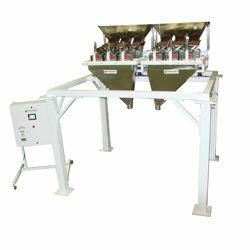 The PMB weighers use the “bulk and dribble” method vibrating the majority of the desired weight quickly into the weigh bucket (bulk speed), and the rest slowly (dribble speed) to provide an accurate weight. 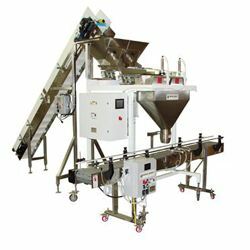 Although each scale uses this method, every model is application specific designed to handle your products, interface with any automatic equipment (new or existing baggers or conveyors) provide the necessary fill rate and cleanly fill into your packages. 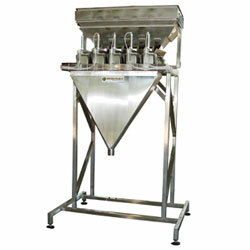 The number of vibratory trays needed to move the product accurately into the weigh bucket is determined by the product’s flow characteristics. 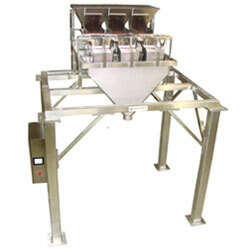 Each system is designed to handle as many of your products as possible. Our standard frame designs come with powder coated finishes and the contact surfaces are 304 stainless steel. If your scale requires all stainless washdown upgrade, USDA or WDA design features, Weigh Right provides these options plus many more. 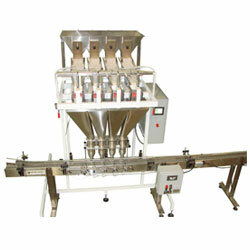 The PMB series is available in 1 to 6 lanes to meet various speed requirements or for batching products together. Our scales come standard with touch screen menu driven controls offering job storage, help menus and easy to read graphics. All scales come with non-proprietary components. Choose from below to find the right scale for your needs.